New Zealand’s native flora evolved without ungulates (deer, chamois, tahr, goats, merinos) and did not develop many of the defensive mechanisms that are present in plants in other parts of the world. Ungulates have well documented adverse impacts on New Zealand’s native vegetation, especially when at high densities. Exclusion of ungulates, including tahr, has led to marked recovery of vegetation in the subalpine and alpine zone. Tahr are often the dominant browsing animal in the subalpine and alpine zone of the central Southern Alps/Kā Tiritiri o te Moana, although other browsers include deer, chamois, hares, possums and merinos are also present. A strong recovery in subalpine and alpine vegetation was apparent when tahr numbers were reduced significantly by aerial hunting from the 1960s-1980s. The Himalayan Thar Control Plan was published in 1993 and sought to balance biodiversity conservation and recreational values by setting density limits for tahr in seven management units, defining northern and southern tahr exclusion zones, and allowing commercial and recreational hunting. This plan was intended to be reviewed after five years and its successful implementation required a proactive approach and cooperation between a number of groups (government agencies, NGOs, commercial interests). A mix of government-funded and recreational hunting was seen as the optimum way to manage tahr numbers to meet the objectives of this plan. Unfortunately, the Himalayan Thar Control Plan has never been properly implemented and the five-year review never undertaken. Tahr numbers have increased substantially since 1993 and the only study of vegetation change over this period (Cruz et al. 2017) shows that tahr have significantly impacted vegetation cover and tussock height through until 2013, when their final field assessments were made. This and other studies suggest that tahr impact both overall vegetation cover (and tussock height) and the abundance of individual palatable species (e.g. species of Ranunculus, Ourisia, Anisotome and Celmisia). Conservation of these communities and species is only possible in New Zealand and tahr are one of the key factors constraining our ability to do this. Notwithstanding this, tahr continue to be a valued recreational hunting resource and are also important for commercial guided hunting. Tahr also occur on a variety of land tenures whose management can have different priorities. Eradication of tahr was probably not possible in the 1980s when numbers were at their lowest and is certainly not possible today (as tahr are now widely dispersed through West Coast forests within their range). 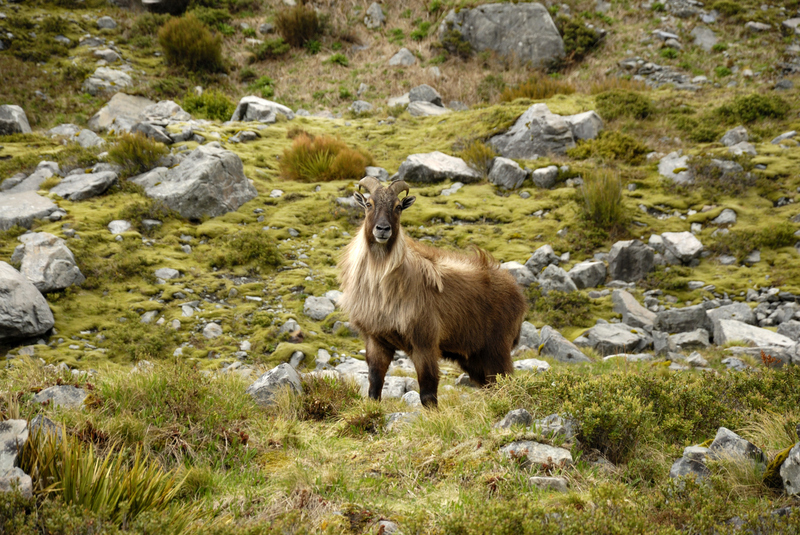 Therefore, in order to balance the biodiversity conservation and recreational/commercial values of the central Southern Alps/Kā Tiritiri o te Moana, the same approach that was advocated in the 1993 Himalayan Thar Control Plan is appropriate today – a mix of density targets for specific management units, exclusion zones where tahr are eliminated from, and genuine cooperative management of tahr. There also needs to be adequate funding for tahr management, including biodiversity monitoring – current gaps in our knowledge around tahr appear to be in part a legacy of the underfunding of the Department of Conservation over the last couple of decades. Managing tahr to levels that balances biodiversity conservation and recreational/commercial values requires good information on the distribution and population structure of tahr across their range, ongoing and detailed information on the impact of tahr on biodiversity conservation values (cf. Cruz et al. 2017), and genuine consultation and cooperation amongst the different parties interested in the subalpine and alpine ecosystems of the central Southern Alps/Kā Tiritiri o te Moana. A science-based review of the Himalayan Thar Control Plan would seem long overdue and an urgent priority. Without the approach outlined here, there is a real risk of perverse outcomes for biodiversity conservation. Conservation is as much a social issue as a scientific one and while there are very clear ecological bottom lines, we also need to consider social issues. Cruz J, Thomson C, Parkes JP, Gruner I, Forsyth DM 2017. Long-term impacts of an introduced ungulate in native grasslands: Himalayan tahr (Hemitragus jemlahicus) in New Zealand’s Southern Alps. Biological Invasions 19: 339-349. Professor Norton works in the School of Forestry at the University of Canterbury. He has 40 years of experience with the ecosystems in the central Southern Alps/ Kā Tiritiri o te Moana through research and tramping. He receives no funding from DOC or hunting groups. This is a thoughtful and authoritative analysis. As journlist, talk of “balance” always furrows my brow, having witnessed the detrimental effect of decades of what we now recognise as false balance. This phenomenon, in which one, minority, side is extended the same presence and influence as a much greater consensus, creates the illusion of debate, of a more nuanced and multi-faceted dilemma than actually exists. The best estimate of “big game” hunters in New Zealand runs to some 85,000. Thar hunters, I suggest, would represent a much smaller proportion of this figure again. Historically, thanks to our colonial mania for acclimatisation, hunting, and fishing, hunters have enjoyed the support of Parliamentarians, and we’re almost certainly still witnessing that long tail twitching. But I would suggest that the remaining 4.1 million New Zealanders would sooner see the high alpine zones returned to health and beauty. If we’re going to talk about striking a balance, let’s take the greatest care not to be swayed by the mirage of an overstated hunting constituency. Good comments Dave. I am one of the 85000 hunters in New Zealand, and although from the north island have spend a significant amount of time in the southern Alps. Over that time it has been interesting to observe who the majority users are of the back country. I would suggest most of our 4.1 million population wouldn’t know what a back country hut looks like, let alone thar, kea and Lilly. My annocdotal evidence is that in areas like the whataroa/rangitata is that hunters are by far the majority users. The rest of the population is sitting at home. The hunters do have a responsibility to control thar numbers, agreed, but the government have a responsibility to consult with the major users of the back country. I see the Minister and others are saying 10000 thar on the DOC estate was the limit set in the Thar Plan. No it was 10000 in New Zealand as the Plan covered land of all tenures. Revision of the limits may be sensible given the changing attitudes of pastoral leaseholders (most saw thar as a pest in past decades) but now with tenure reviews with a higher percent of the thar range now in the conservation estate, and money to made selling hunting access I guess many now see them as an asset.